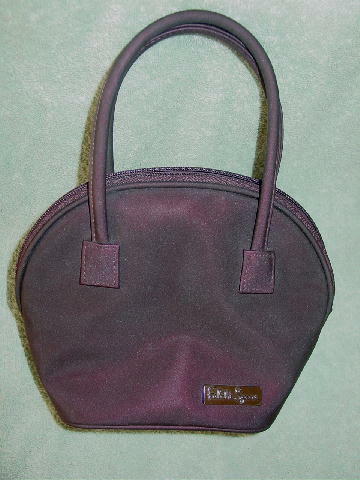 This iridescent synthetic handbag is by Falchi Sport. 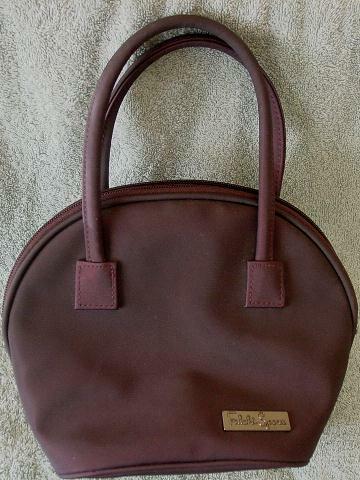 It's in brown raspberry-wine color and it has a zipper that goes from one side to the other. There is a small metal rectangle on the front bottom that has Falchi Sport in elevated letters on it. There are two 13" long padded handles and it has a brown plastic lining. It's from a European model. She put her initial on the front side lining of this purse. She did that with all her possessions, because her roommate was always borrowing her things and never returning them.